Asking cagers to be aware of motorcyclists is quite common. You see those electronic signs on the highways stating in bright neon letters: WATCH FOR MOTORCYCLISTS. You see bumper stickers with the “Look twice, save a life” saying. You see it in the news every day; another biker death or injury due to a careless driver. In driving school when you get your license – instructors tell you to look before merging, use your indicator, and drive defensively. So watch out for cagers, right? The trick is to watch out for every moving thing on the road. Whether it be a fellow biker, a cager, a bus, bicyclist, trolley, pedestrian, anything. There are many drivers who should not be on the road, and I’ll admit that there are a few bad motorcyclists as well. Some swerve in and out of traffic, tailgate, speed relentlessly, and cut off others without signaling. There are bad riders just like there are bad drivers. 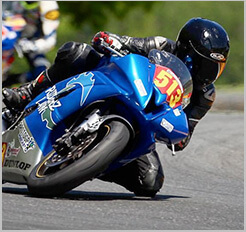 The margin is just smaller, because in order to operate a motorcycle, you need to be fully aware of all surroundings. When riding, there are no distractions like food, phones, crying babies in the back seat. All is focused on the road and trying not to go down. It is easy in a car to get distracted and feel safe enough to not concentrate so hard. Not the same for a motorcycle, you must pay 100% attention. This brings me to the point to be defensive no matter who is next to you on the road. I once heard of a story where a motorcyclist was so enraged when sharing lanes in heavy traffic that he was speeding and putting his life and others in danger. He probably felt people were not paying attention or not giving him space, or maybe he just had a bad day at work. Another motorcyclist came up behind him while sharing lanes, and the first biker would slam on his brakes to annoy the second biker and not let him pass. When the second biker tried to pass, the first would cut him off, nearly dropping his bike and creating an accident. Motorcyclists have an unwritten “brotherhood” or “bond” and we all normally respect one another. We wave to one another on the road, give compliments on each other’s bikes, and wish them a safe ride home. Even if we are complete strangers. When was the last time a car driver waved to you and said “Sweet vehicle, get home safe!”? It just doesn’t happen. If a biker is on the side of the road and needs help, most likely it is another biker that will stop and get him on his way. May sound cliché and repetitive, but please drive defensively. I am sure you hear it all the time, but it is so very important to do 24/7 while riding or driving. Do not trust all on the road to pay attention though, from time to time life will throw you a bad rider, or cager, and the only way to be prepared is to be defensive. Watch out for all commuters on the road!